My experience in France was the best two months of my life so far and I would do it again in a heartbeat! It has made me a more confident person and given me more perspective about life. I chose to go on an AFS intercultural study experience because I was learning French at school and wanted to experience French culture. Speaking French during my exchange was very challenging and I was shy and didn’t want to make mistakes and embarrass myself. Towards the end I could feel myself becoming more comfortable and trying to speak more. However, I did manage to pick up new phrases and words that were commonly used, which has helped me in my French studies at home. Since returning from my overseas study experience during high school, I have gotten better grades in French than I would have if I hadn’t gone to France – my French definitely improved. Immersing myself in the AFS experience has also made me want to travel the world and realise how possible it is. My host family was very caring and generous and wanted me to have the best experience I could. I had two younger host siblings (aged 6 and 7) and they were very helpful in making me feel comfortable in the family. My favourite memory would have to be at the very end of my exchange when I met up with everyone from the beginning of the trip in Paris. We had all been through the same thing but we all had such different experiences so it was interesting hearing those stories. 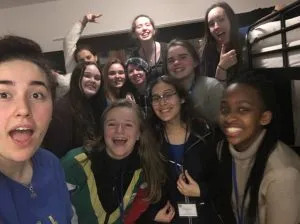 We all became pretty close after only being with each other for around 3 days for the orientations and it was great because we were all from different countries so we all made friends we never would have if we hadn’t gone on this exchange. My advice to parents would be to support your children to do an AFS Intercultural program. In doing the exchange, your child will become a better version of themselves and will learn independence. 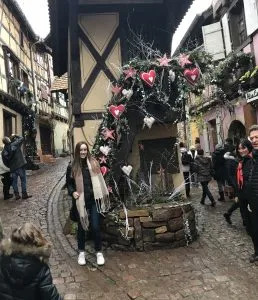 I’d like to go back to France for a couple of months when I’ve finished year 12 and stay with a student we (me and my family in Australia) hosted this year. I would also like to live in France for a couple of years and continue developing my language skills to speak French fluently. If everyone could go on exchange the world would be a more peaceful place because everyone would be exposed to different cultures which would create more understanding.